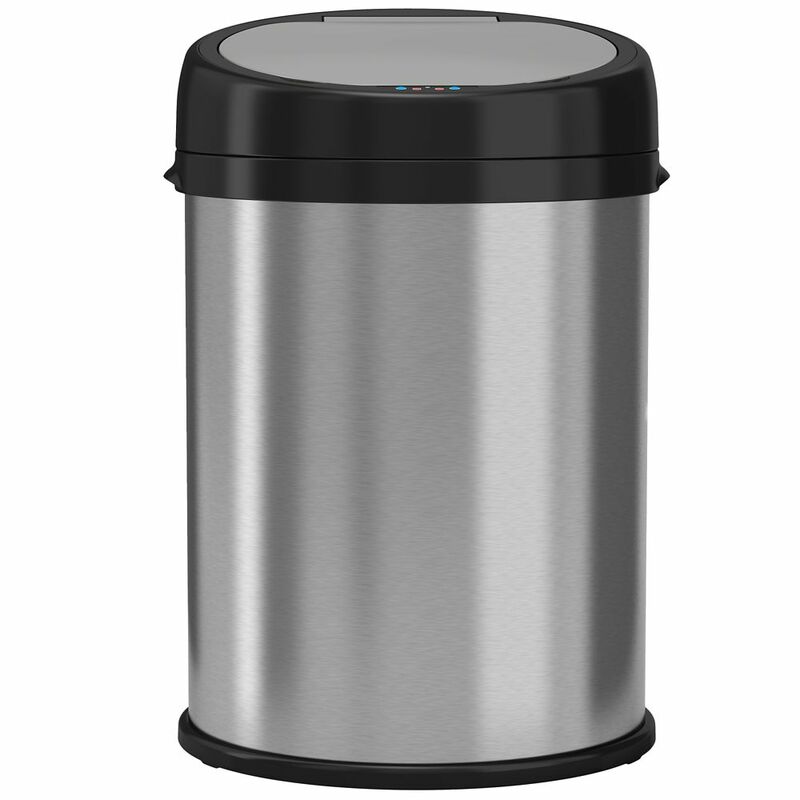 The stainless steel Touchless Trash can RS has a UV coated lid cover that automatically opens and closes using up to date infrared sensor technology, keeping hands cleaner and odors contained. This free standing waste container is ideal for high traffic areas requiring the quality and durability of an all stainless unit without the commitment of wall mounting. The 310 offers clean geometric design lines with radius corners, ideal for lobbies and reception areas. Garbage can comes with standard bag holder apparatus. Waste opening is 8.5" in diameter. Shipped in a durable corrugated container. Body comes with a protective plastic to be removed after installation. Garbage can is all stainless steel construction, brushed finish. Spun 18 gauge stainless steel top. One piece roll formed 22 gauge stainless steel body. 22 gauge stainless steel spun bottom. Code 316 recycling container allows for flexible mounting locations in areas requiring three streams. Can be used in commercial or residential settings. Anchors are included to secure the Code 316 in both indoor and outdoor installations. Adjustable feet on code 316 allow for easy levelling. Flexible labeling kit accommodates specific separation requirements. Ergonomic front loading door reduces risk of back injury. Inclined top discourages use as a table or chair. All exterior components are fabricated metal for maximum fire protection. Leak proof roto moudled polyethylene liners. Full length piano hinge on doors. Keyed tumbler lock on Code 316. Waste/Recycling material hole size is 6" in diameter. Materials: 18 gauge stainless steel. The 303 wall mounted waste receptacle is designed to conserve floor space in medium to light duty areas. Garbage can has all steel construction that offers maximum fire protection with no openings on sides or bottom of unit. Tight sealing head and spring loaded door promote oxygen starvation. When used with optional galvanized liner there is added insulative fire protection. Comes with standard bag holder apparatus. Body constructed of 22 gauge steel and the head with 20 gauge stainless steel. 8 Gallon Round Extra-Wide opening Stainless Steel Automatic Sensor Can The stainless steel Touchless Trash can RS has a UV coated lid cover that automatically opens and closes using up to date infrared sensor technology, keeping hands cleaner and odors contained.